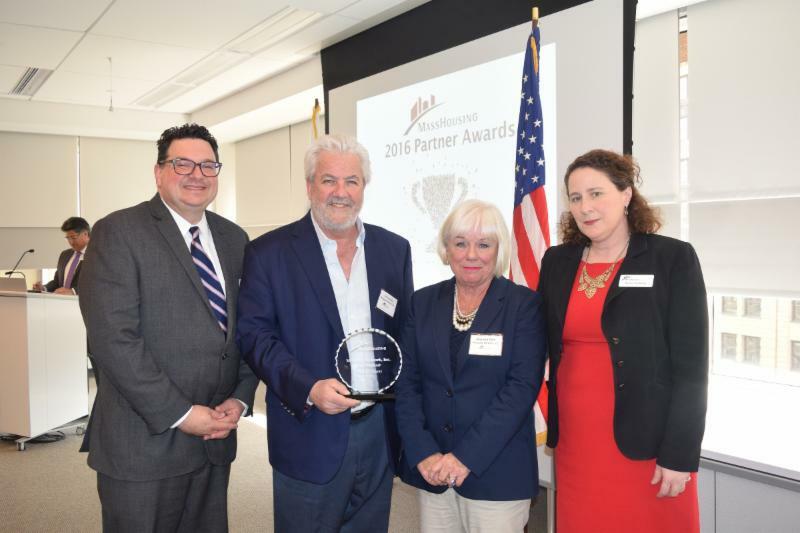 Mortgage Network Inc. has been honored by the Massachusetts Housing Finance Agency (MassHousing) for its commitment to providing affordable financing options to qualified first-time and low- and moderate-income borrowers. Pictured above are Timothy C. Sullivan, executive director of MassHousing; James Comosa, president of Mortgage Network; Maureen Elliott, NE regional manager for Mortgage Network; and Karen E. Kelleher, deputy director for MassHousing. Mortgage Network was the third largest provider of affordable mortgage products in the state in 2016 with 205 loans totaling more than $48 million. The company's Longmeadow office was honored as the top producer of affordable mortgage loans in Franklin County, with 11 loans totaling more than $1.8 million. The company and other top producers of affordable mortgages were honored at the MassHousing Partner Awards breakfast today in Boston. This is the fourth consecutive year that Mortgage Network has been honored by MassHousing as one of the top providers of affordable mortgages in the state. "Our company has always been committed to helping deserving borrowers achieve homeownership," said Brian Koss, executive vice president of Mortgage Network. "As home prices rise, affordability is a major issue for many would-be homebuyers. The affordable housing programs provided by MassHousing are important tools that help many consumers overcome down-payment hurdles and achieve the dream of homeownership." MassHousing is an independent, quasi-public agency created in 1966 and charged with providing financing for affordable housing in Massachusetts. The agency celebrated its 50th anniversary last year. Through its lender partnerships, the agency produced 3,190 first mortgage loans totaling more than $776 million in 2016.